Are you having trouble receiving your Joke-of-the-Day? Are you having trouble seeing our pictures? Many e-mail services and Internet Service Providers (ISPs) have blocking or filtering systems in place to protect you from unsolicited e-mail. However, these same systems may inadvertently block e-mail you have requested from Joke-of-the-Day.com. To ensure you receive all our emails, please add our email address to your address book or trusted senders list. Similarly, if you're having trouble seeing our pictures, you may have to take additional steps in order to display our images. If you need help, we've included instructions for several popular mail services and programs below. If the ISP you use to receive your emails is not listed below, you will need to designate us as a trusted sender. This is can be accomplished by adding our From address (i.e. example@domain.com) to your address book, contact list or safe list. We often send our mail from more than one domain, so you may have to add several addresses into your address book! The difference is small, but your ISP or email service will likely consider these as two different email addresses. In order to receive all of our emails, you may have to repeat some of the steps below for our multiple domain names. Open the email you received from Joke-of-the-day.com. **Can't see images? In the upper right corner of the message window, click Show images & enable links. Click SAVE ADDRESS at the top of the message header. * If Hotmail has identified our email as junk, click on the "Not Junk Mail" button. ** Can't see images? At the top of the message click "Never disable content from this sender." Click on the Add to Address Book link that appears next to the From Address. You'll be taken to a new screen. Click on the "Add to Address Book" button here. 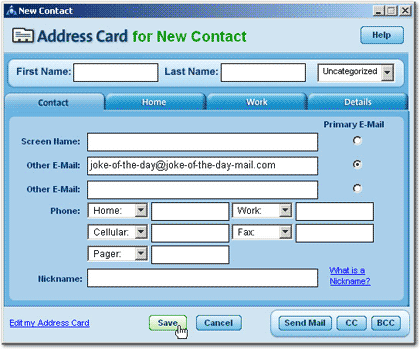 You will then see a confirmation message at the top of your screen indicating that joke-of-the-day-mail@joke-of-the-day-mail.com has been placed in your Address Book. Click on General Preferences under the Personalization heading. Go to the Security section and UNCHECK the box marked: Block HTML Graphics in email messages from being downloaded. Then click Save at either the top or bottom of your browser. ** Can't see images? Try refreshing your browser by clicking on your browser's refresh button! Add us to your Contacts list. Click the drop down arrow next to the Reply Button. You should see an option that reads, "Add Joke-of-the-Day to Contacts list" Click on that to add us to your Contacts list!